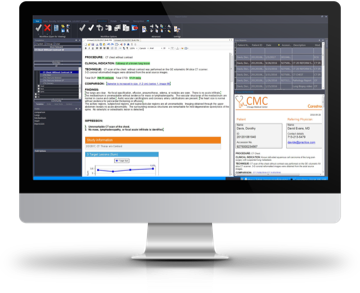 Accelerate turnaround time with user-defined templates, structured reports and embedded voice recognition. 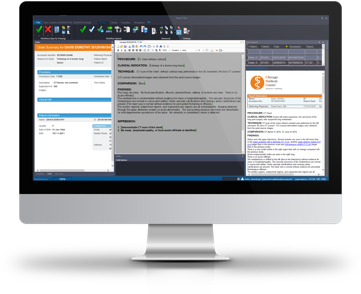 Provide reading and reporting in a single workspace, with key images presented alongside patient details and analytical information. Reduce costs and improve outcomes with one system that’s easy to deploy and train across multi-site, multi-vendor environments. Reporting from any place where images can be viewed with less work and fewer errors. Simple, structured native reports enables fast evaluation and quality reporting via access to priors with hyperlinks. Multimedia reports, including key images and charts for a smart and intuitive hyperlink navigation enabling value-added communication with patients. No need for special drivers or third-party software, less integration and simpler deployment during upgrades. 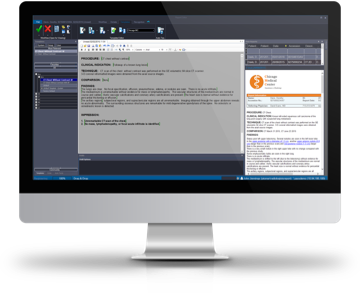 The Interactive Multimedia Reporting Module, with embedded voice-recognition capability, can help cut your turnaround time to the bare minimum. It entirely eliminates the need for typing and entry of patient or clinical context. Exam data can be inserted directly into reports. 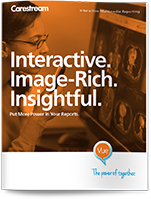 This allows radiologists to quickly review and approve final reports, while adding clinical context for referring physicians. Multiple and dynamic features in the healthcare IT reporting module improve productivity for the radiologist. These features include color coding wording to reduce errors, structured fields, and hyperlinks to previous studies and medical clinical reports.